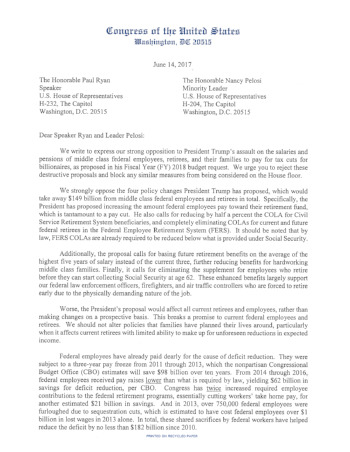 Yesterday, 102 Members of the House of Representatives sent a letter to Speaker Paul Ryan (R-WI) and Minority Leader Nancy Pelosi (D-CA), strongly opposing the assaults on federal pay and retirement contained in the administration’s fiscal year (FY) 2018 budget proposal. Calling the administration’s proposals that impact the take-home pay and retirement benefits for current federal employees and retirees “destructive,” the legislators asked both congressional leaders to block any effort to bring such proposals to the House floor for votes. They pointed out that no other group has been asked to sacrifice more for deficit reduction than the federal workforce. Federal employees have already been deprived of $182 billion in pay and benefits. The FY 2018 budget would add another $149 billion in cuts. We appreciate these members’ support in fighting to stop pay and retirement cuts, and for holding Congress accountable to keep its promises to its workforce and retirees. Clearly, these members of Congress recognize the valuable service provided by our members to the nation. NTEU will continue to work with these members to “oppose any effort to balance the budget on the backs of public servants,” as the legislators wrote in their letter. To learn more about the budget and legislation, please visit the NTEU legislative action center.